This is wonderful stuff. Footage of Britain's railways matched to pop songs, radio recordings and television theme tunes from the same year. It is odd how some things date faster than others. I have a book about Romney Marsh from the 1960s that contains a photograph of the car park at the nuclear power station at Dungeness. The power station itself still looks strange and futuristic today. The cars are laughably old fashioned. Here I think that, in many cases, the railway footage appears more dated than the music sounds. an impenetrable, physical, deep, powerful, beautiful ha-ha. It will keep out invaders and, incidentally, keep in domestic staff. Incidentally, while we were out in the garden it started to spit, but when I suggested we go indoors she replied: "I’ll do my scrying in the rain." Lord Bonkers tells me he "caught two fellows with snow on their boots going through the Shuttleworths" at a remote rural committee room during the Ripon by-election of 1973. I took a party of Liberal Democrat peers (you may have noticed we are not exactly short of them) off to the tearoom for a spot of training in Hard Stares and pulling the aforementioned faces (though the Jenkins is not one for novices). I am proud to announce that, after I had left for home, one of my pupils made a junior minister cry. Such deep-cover agents are not unusual – I expect my readers could name a few themselves – but to the best of my knowledge Jeremy Corbyn is the first Conservative to lead the Labour Party. Having observed Corbyn's support for Brexit since then, I am forced to conclude he is right. He was also proud when the party's press team came to the Bonkers Home for Well-Behaved Orphans to take a photograph for one of our general election posters. Despite the best efforts of the Elves of Rockingham Forest, I turned up a photograph of Bonkers Hall I took before I met Lord Bonkers. I also found conclusive proof that Freddie and Fiona work at the New European. Lord Bonkers himself gave the inside story on the fall of Tim Farron. Bathing, running barefoot across the sand, burying Matron... I had a high old time of it. There was our own Vince ‘High-Voltage’ Cable; the Wise Woman of Wing; the High Queen of the Elves of Rockingham Forest; and the Professor of Hard Sums from the University of Rutland at Belvoir. I was prevailed upon to join the panel myself and, best of all, there was not a member of the Dimbleby family in sight. Lord Bonkers feared that the theft of the Liberal Democrat candidate for Cheltenham's bicycle was an attempt to sabotage his campaign, but I feared something even more sinister was going on. "If the Conservatives care about the future of their party they would do well to ignore the squeals coming from the swivel eyed ideologues and listen to the warning Lord Heseltine is trying to give his colleagues." George Turner believes Brexit may yet destroy the Conservative Party. Phil Wainewright says the Remain campaign in the referendum let Britain down by its complacency. Will plans to divert Metropolitan Line trains into Watford Junction hit the buffers? And if they do will it be Boris Johnson's fault? A fascinating post from London Reconnections. Passing football began in working-class Lancashire according to Conor Pope. John Fleming argues that the BBC drama Eric, Ernie and Me rewrote history by pretending the BBC made Morecambe and Wise famous and writing-out their giant success on ITV before they joined the BBC. It was 50 years ago this week that Traffic's first album Mr Fantasy entered the charts. The fruit of the band's 'getting it together in the country', it was to reach number 16. 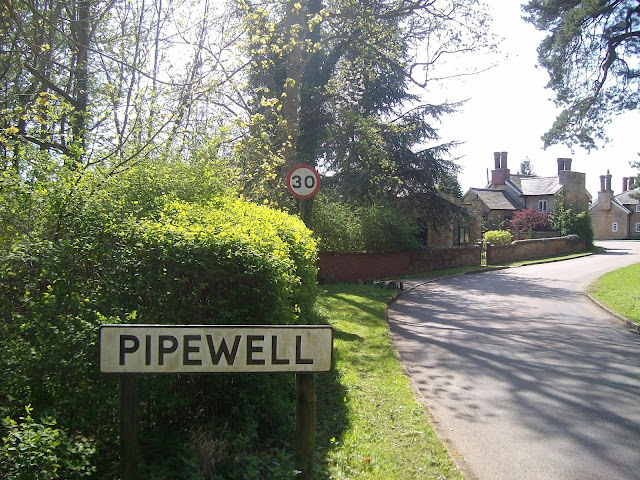 The album's origins in a cottage near Aston Tirrold in Berkshire is reflected in the title of this track - a title that could have been borrowed from a John Betjeman poem. Helping out with the backing vocals are the Small Faces - Steve Marriott's voice is unmistakable. Being Jacob Rees-Mogg is a full-time occupation, or so I argued. I got to the remains of the lead mine at Snailbeach, so 2017 turned out to be a good year after all. Writing an article about Richard Rorty for Liberator left me less sure that I agreed with his ideas. He did foresee the rise of Donald Trump though. I asked if the Liberal Democrats would win a Sheffield Hallam by-election and recorded an actual success for the party: a former candidate had forced the resignation of the deputy prime minister of Australia. I found that in 2009 I had inadvertently photographed a relic of a Lincolnshire potato railway. Good Liberals were up in arms when Damien Green's office was raided, as I reminded my readers. Much good it did him. Vince Cable, I revealed, was naughtier than Theresa May when they were children and I enjoyed the Eric Ravilious & Co. exhibition in Sheffield. While bidding farewell to Phil Reilly as the Lib Dems' director of communications, I took issue with his account of the party's history. A walk through what was once Leicester's most notorious slum district revealed connections with Jack the Ripper and a 19th-century cricket ground. Now that's psychogeography. Santa's sleigh run was called off in Market Harborough because there was too much snow. I reported the good news that the chequered skipper butterfly is to be reintroduced to Rockingham Forest. Shadowy in the thickening mist, the two girls seemed to see a figure on horseback waving ghostly arms but no sound of hooves came to their straining ears. Then far away on the hilltop, it seemed to Peter that tiny, gnome-like figures flitted in uncanny procession. 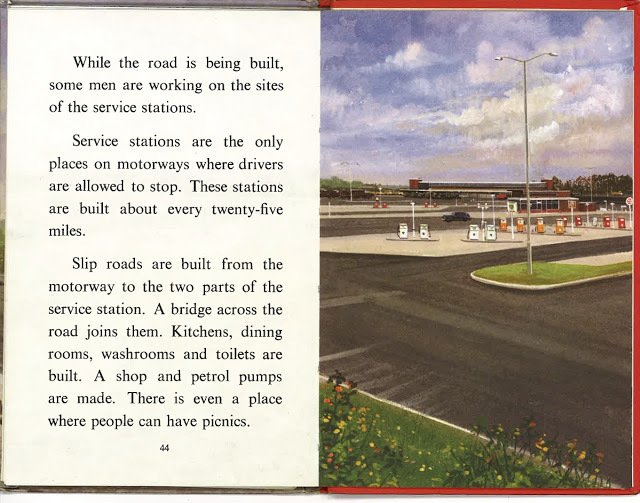 Talking of children's books, I mounted a staunch defence of Ladybird Books: "I cannot think of a more progressive children's published in their era." 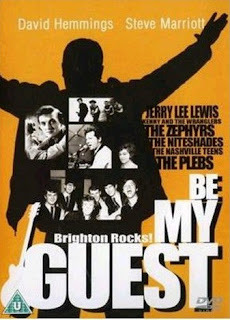 I watched DVDs of Tom Brown's Schooldays from 1971 and The Strange World of Gurney Slade from 1960. Last year I blogged about the discovery of live hand grenades on a recreation ground at Weedon Bec in Northamptonshire. Then the BBC said the Ministry of Defence was examining ways to "provide financial support to the parish council. Now BBC News says it has given the council £500,000 to pay for the clearance work. That sounds generous, but it is not. Since the discovery, the site has needed 24-hour security, which the parish council has has to pay for. This has meant an extra £250 a year in council tax for each household. "I have lost hours and days of sleep over this. It's horrible as we have had to increase council tax in the village and that has made people cross." Weedon is a village with strong military connections. 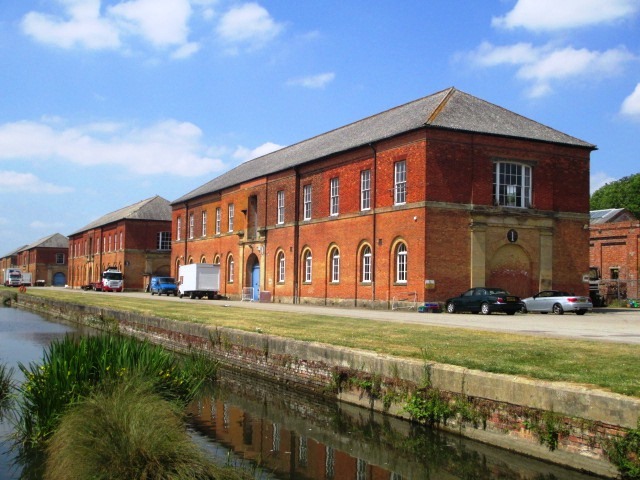 It was the site of a barracks and of the Royal Ordnance Depot. 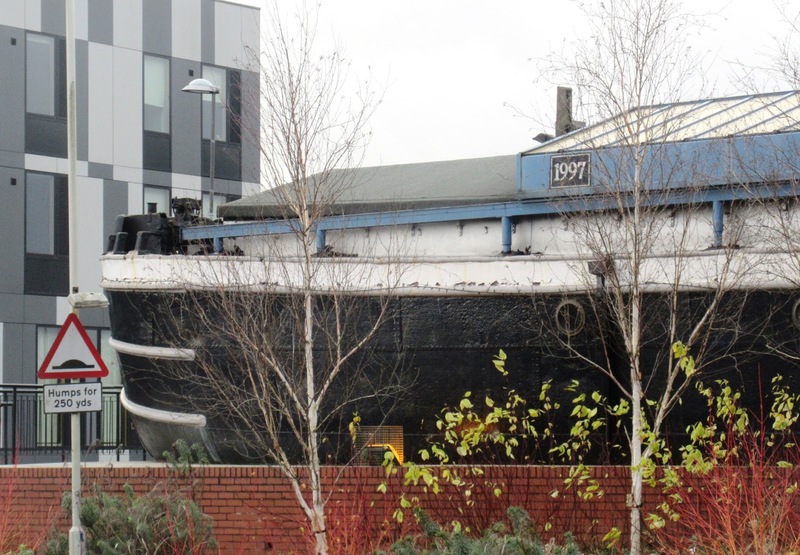 I blogged in October that Leicester's Dry Dock pub, housed in a boat on Freemen's Common, was due for the breakers yard because the University of Leicester is planning to redevelop the area. Finding myself in that part of the city today, I had a drink there. With students at home and Leicester City supporters at Anfield, it was missing its most reliable customers and almost empty. It did have a good range of beers though. You can read more about the university's plans for the area in the Leicester Mercury. The greatest challenge on Gigolo was filming the 78-year-old Marlene Dietrich. She had refused, of course, to come to Germany, where she hadn't been since before the war. Instead we had to transport a complete set to Paris. He also reminisces about being introduced to Berlin's more bizarre clubs by Kenneth More, but that is not relevant here. As well as Dietrich, Just a Gigolo starred David Bowie, Kim Novak and Hemmings himself. Here you can listen to Bowie and Hemmings talking about the film. Somehow, all the tensions during production seemed to show through in the picture. I cut and recut it to suit possible distributors (who were not easy to find) and, when the money ran out, I left and the whole thing was cut to ribbons in a way that lost all the humour and irony. Hemmings also shot a documentary on Bowie at about the same time, which has never been seen. That may be a great loss. I once published a post with this title showing Alastair Cook singing Glory to God as part of the choir of St Paul's Cathedral in 1997. Here he is (at 1:43) singing Hark the Herald Angels Sing at the same event. This carol was traditionally sung on the second Sunday after the MCC's fixture with a New South Wales Country XI. A snap of Bonkers Hall I took years before I met Lord Bonkers turned up again, while the death of James Davidson left Elizabeth Shields as the older former Liberal MP. I watched cricket at Mr Logan's ground in East Langton and came across the restoration of a historic house in Kibworth Beauchamp. My travels took me to Bottesford church and to the bridges over the Nene at Irthlingborough. I went off to Shropshire with the songs of Scott Walker in my head. It transpired that the expensive new trains being ordered for the Midland main line out of St Pancras will be slower than the ones running now. I found that left and right were uniting to shift the blame from the Nazis marching in the United States and explained why I never bought Jeremy Corbyn's story on traingate. Don't believe I got to Shropshire? Look, that's Stokesay Castle above. Brexiteers, I argued, still treat Australia as though it were moored off the coast of Kent. I didn't want John O'Farrell to tear up his Labour membership card over Kate Hoey, I just wanted him not to vote for her. Gender-neutral clothing for children was in the news. I pointed out that my first literary hero Malcolm Saville had no problem with it in the 1940s. I wondered if Jacob Rees-Mogg believes masturbation is wrong - there was a reason. The psychologist Steve Reicher said in a lecture I attended that that if we are to understand the appeal of Donald Trump (and of other authoritarian populists) we have to get away from the idea that the people who voted for him are merely wicked or stupid. 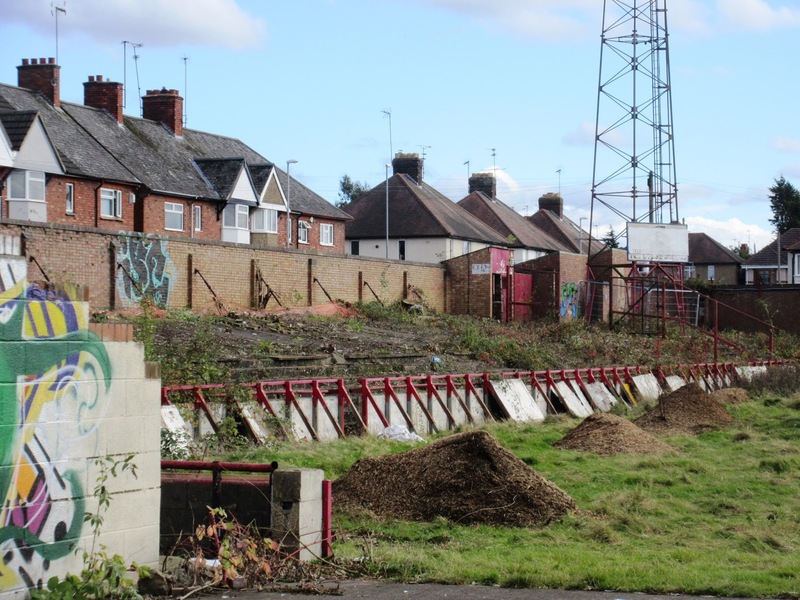 I asked if English cricket has a drink problem and photographed the death throes of Kettering Town's old Rockingham Road ground. In a nice seasonal touch, the woman in question is called Natasha Claus. She has also been banned from entering Woking. Thanks to a reader for the nomination. A passing reference in a Londonist article on King's Cross and St Pancras sends you to the website of Wanstead United Reformed Church. Our building has an almost unique history. Built in the parish of St Pancras and known as St Luke’s, it was consecrated in May 1861. Only two years later the old Midland Railway wanted to extend its line into London and needed the site of St Luke’s for a terminus station – it was the only site available. In Wanstead, a group of Congregationalists wanted to build a church for their worship and heard of this building in the Kings Cross area. They bought St Luke’s for £526, and a builder from Walthamstow demolished, transported and re-erected it on our current site. The foundation stone was laid on 7th August 1866 and the church opened for worship on 30th May, 1867. The site wasn’t quite the right size and shape to receive St Luke’s in its original form; the main body of the church is now shorter; the entrance and porch on the north side were not rebuilt. This is a photograph of the original plan for the building with a huge central spire. Our Cromwell Hall (on the Nightingale Lane side of the church) was also part of the original building. The picture above, taken from Google Street View shows the church today. A new St Luke's was built in Kentish Town to serve its parish at St Pancras. It was in the care of the Churches Conservation Trust for 20 years, but reopened as a living church in 2012. What to make of Anthony Newley? I was awestruck by Tony Newley; he was intense, anguished, and seemed completely detached from the rest of the world. He never spoke to me – that was part of his mystery – but I watched him obsessively from the wings … Every night I mimicked his words, and gazed agonisingly into the spotlight pulling a heartbroken face, just like he did. Today, when Newley is something of a forgotten figure, it is hard for any of us to be sure, but I have a feeling he was more important than we realise. He links two great eras of 20th-century British culture – 1940s cinema and 1960s pop – co-wrote the songs Feelin’ Good and Goldfinger, influenced David Bowie’s singing and was negotiating for a regular role in EastEnders when he died. So what to make of The Strange World of Gurney Slade? I have long heard of this 1960 comedy series and recently bought and watched the DVD. It begins with the hero Gurney Slade, played by Newley, escaping from an awful situation comedy and going out to explore the world. There he indulges in internal monologues about the absurdities of everyday life that you can imagine in Tony Hancock’s voice. Then a section about the absurdities of dating, featuring Una Stubbs in a very early role, looks forward to observational comedy. After that things get really strange. There are a group of children – strange symbolic children who resemble the ones you find in 1940s Hollywood films such as The Blue Bird and The Boy with Green Hair. And it ends with a spot of the absurdist theatre that was popular in 1960s as the characters sit round and waiting to be written into another show. The cast is strong: Bernie Winters, Hugh Paddick and Fenella Fielding turn up, while the floor manager Newley brushes off as he makes his escape at the start is played by a young Geoffrey Palmer. It didn’t make me laugh, but then Charlie Chaplin doesn’t make me laugh even though I can see he is a genius. In the same way, I can see that The Strange World of Gurney Slade is important and interesting. And the show gives its own answer. At one point Newley is put on trial for not being funny and after rejecting the defence counsel supplied by the court, and awful red-nosed comedian, defends himself. If being like him is what is meant by being funny, he asks by implication, who wants to be funny? The best comment on the show is to be found in a trailer Newley made, still in character, for its second showing. Gillian Mawson's guest post on World War II evacuees proved very popular. "If they were setting out to lend support to the idea that European cause was a cause for metropolitan types who laugh at the rest of us while eating their artisan quinoa, they could not have made a better job of it." No, I did not like the New European article on Skegness. Sir Edward Garnier, who turned out to be the retiring MP for Harborough, was a Remainer. His successor won't even tell us how he voted in the referendum. I was quoted in the Bath Chronicle saying that the Liberal Democrats had a good chance of winning the city at the general election. This proved more accurate than many predictions made at the time. A Conservative local election leaflet used one of my photographs and I was taken as an explorer in Loughborough by two boys who were probably not ghosts. The local elections were a disappointment for the Lib Dems, but we held the ward I live in. An archaeological dig of Roman remains in Leicester attracted crowds and I stalked the Boughton Obelisk. I went to St Albans to help in the general election campaign. Discussing the importance of John Noakes, I suggested that the Sixties were an unusual decade in that the British rather liked children then and that life should be more like Go With Noakes. It was all too long ago to worry many voters, but I explained why Jeremy Corbyn's attitude to Irish Republican terrorism worried me. I went to see Newark Castle and the former Lutterworth police station. The men in sandals came for Tim Farron. I said Jo Swinson should calm her allies down, but there was no need. She withdrew from the contest and Vince Cable became the new leader without a contest. An old Liberal Democrat News column turned out to offer an analysis of class and politics in Kensington after the Grenfell Tower fire. 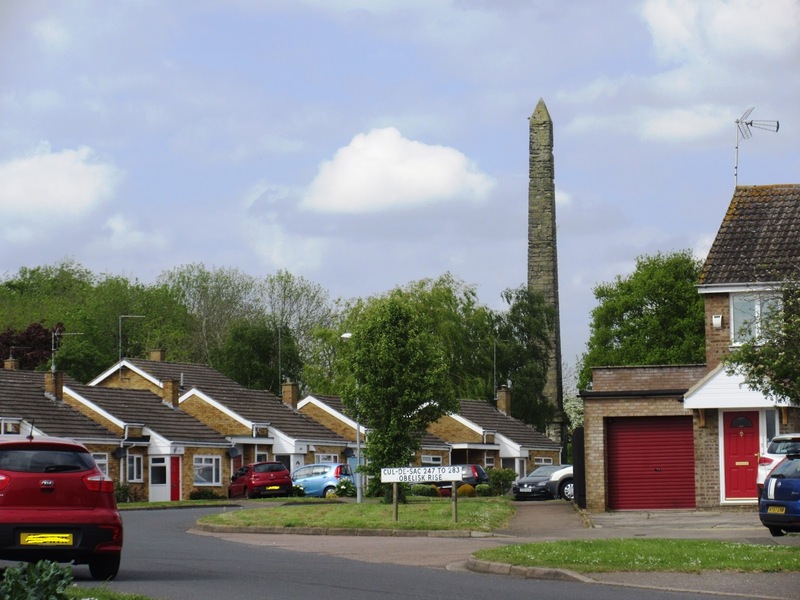 Other visits took me to Northampton's Eleanor Cross and the Buddhist cafè at Kelmarsh. "I’m still not convinced that he was particularly brilliant in the successful campaign in 2010 ... He faced a still toxic Tory party and a Labour party that was weary and run down after over a decade in government, and still managed to lose seats." 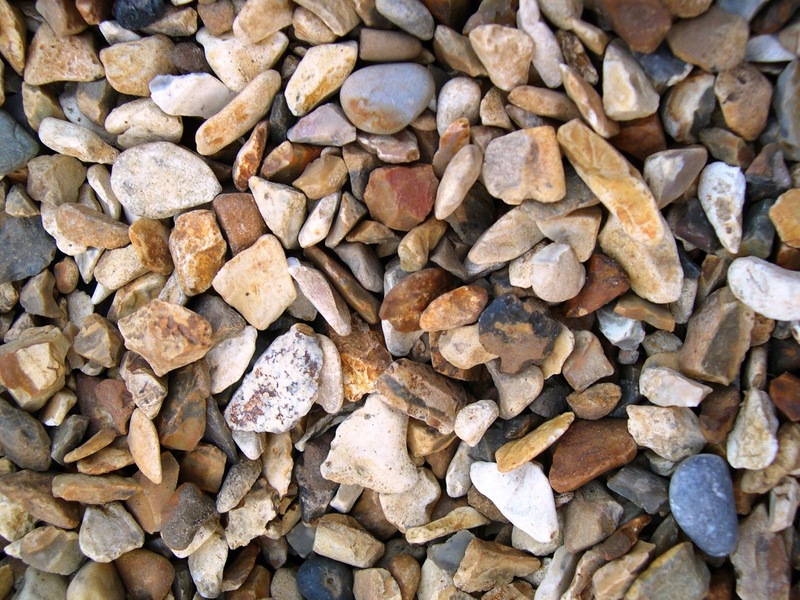 William Barter offers a reappraisal of Nick Clegg. Steve Peers looks at the threat to workers' rights after Brexit. Geoffrey Wheatcroft discusses the career of Conor Cruise O’Brien on the centenary of his birth. Christmas Day 1977 marked the beginning of the end of an era for British light entertainment, argues Curious British Telly. Mark Gatiss talks to Shadows at the Door about Doctor Who, M.R. James and horror films: "I'm actually more interested in modern horror; the gothic but in a modern context. I don't think it has to be about the old and obviously I still love it but it doesn't have to be about candelabra and castles. You can get the same feeling from modern methods, and in a way that is more frightening." "Khodarkovsky estimates that about half of the players who show remarkable skill before the age of 10 will give up on chess entirely. And he blames, at least in part, the attention we shower on prodigies." David Hill finds that chess prodigies are getting younger. I said Yes to Leveson 2, No to Section 40 and offered some thoughts on Vince Cable, British Asians and Brexit. "This is wonderful", I said, when posting this video of Paul Robeson singing to Scottish miners in 1949. It is. I argued that Just because Paul Nuttall is from the North, it doesn't mean he will appeal to Northern voters. Call me Mystic Meg. I was complimentary about Tim Farron's leadership of the Liberal Democrats over Europe. Stewart Lee joined the Lib Dems. In the first episode a 10-year-old boy rides his bike into the Llangollen Canal as it passes over the Pontcysyllte Aqueduct. The trough stands 126ft above the River Dee, there is a sheer drop on the opposite side to the towpath and it is scary enough making the crossing in a boat. A song I had been trying to identify for years turned out to be Mary Wana by The Nicotines. I also said I would like to see Michael Haneke’s Time of the Wolf again. Meanwhile, the Conservatives discovered that the North is massive. I wrote about Stanley Rundle and the 1960s Liberal revival in Richmond upon Thames. The Orange Book, I recalled, had been too statist for me. Shall think themselves accursed they were not here. British deference to the Royal Family, I discovered, had protected child abusers in Australia. The chairman of Harborough Ukip tried to find people to stand for his party by telling them they could avoid going to meetings and collect their expenses "until they are asked to leave". And on my birthday I marched for Europe. Schoolboys with long hair who fight, gamble and drink? They can only come from the early 1970s. And indeed they do. This is a still from the BBC’s 1971 adaptation of Tom Brown’s Schooldays, which I recently bought and watched on DVD. I had watched it only once before – when it was first broadcast – yet I found I remembered some lines of dialogue. Asked me what I watched last night and I would struggle to tell you. It has a rollicking plot that owes little to the book and is obsessed with flagellation. Tom Brown is framed for poaching and beaten in front of his house. The truth comes out and Flashman is beaten in front of the school and expelled. Richard Morant’s Flashman makes a good villain. Even more enjoyably villainous is his father Sir Richard Flashman, a character unknown to Thomas Hughes, who is played by Gerald Flood. Trivia fans will be pleased to discover that he is the grandfather of the rugby player Toby Flood. A word too for the good older boys – Diggs, played by David Hampshire, and ‘Madman’ Martin, played by Robin Langford – who threaten to steal the production at various points. It may not feel like it to me, but 1971 was a long time ago and all the actors I have mentioned so far are now dead. But the three reprobates in the shot above are still with us. Taking them from the right, Sunning (or ‘Apollo’ as East insists on calling him for his blond hair) was played by Richard Gibson. He grew up to be Herr Flick of the Gestapo in ‘Allo ‘Allo. East was played by Simon Fisher-Turner, who survived Jonathan King’s attempt to turn him into the British David Cassidy and is now (as Simon Fisher) a successful composer of film music. At the age of fifteen he had won an Emmy award for his starring role in the BBC production of Tom Brown's Schooldays. 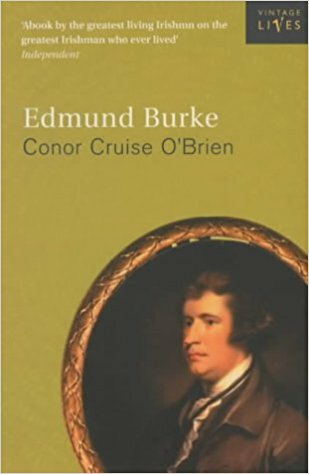 And at twenty four, having starred in the tabloids as the heroin-addicted hang gliding husband of a Duke's daughter, he rebelled against the rebel in himself, gave up drugs, obtained a divorce, and entered a law firm. But I wondered how, in his mid-thirties, he could reinvent himself as a painter and survive with a new family in a grand old ruin of a house on top of a hill near the medieval city of Carcassonne with views of the Pyrenees. You can view his paintings on his website. Drive to Crowland Abbey along the lonely fen roads on a misty December afternoon as the dusk is falling and you feel as though you are driving into the past, when the world seemed to consist only of water and sky; where small, isolated communities clung to muddy islands that raised themselves a few feet out of the undrained fens. This was the world to which the former soldier Guthlac came in 699 AD, to one of the little islands – Crowland – where he would live and die, and where a great abbey would be built in his memory. The abbey is now largely ruinous, but part of it serves as Crowland's parish church. The electrification of the Woodhead route from Sheffield Victoria to Manchester Piccadilly was completed in 1955. 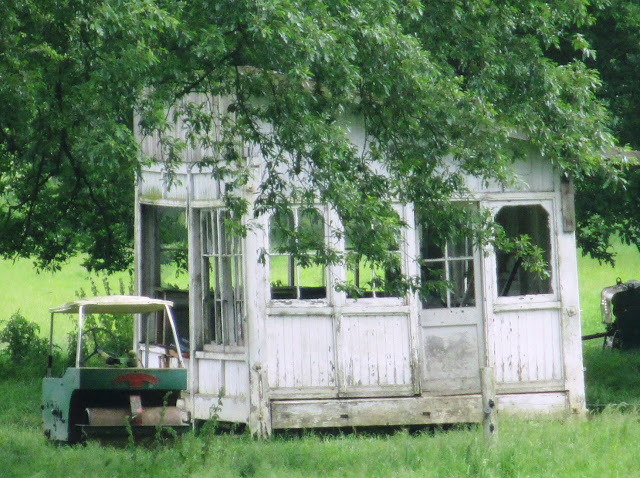 Yet it closed to passengers in 1970 and freight in 1981. When I was a student, Sheffield to Manchester passenger trains were still regularly diverted over it on Sundays and Sheffield to Huddersfield trains used it as far as Penistone. This silent film shows passenger trains on the route just before they were withdrawn. Vic Marks was a high-class bits and pieces player who got to play tests and one-day internationals for England because of his alliance with Ian Botham. He is now the best summariser on Test Match Special, but is often overlooked by the BBC because he does not seek controversy. Marks's modesty is one of his most attractive features. I remember him purposely taking a back seat as Michael Vaughan and Graeme Swann launched a double-barrelled assault on England's then hopelessly outdated approach to limited overs cricket, which I suspect had an influence on the authorities. He gets his due in the latest Guardian Ashes podcast, where he talks to two amiable young Australians Geoff Lemon and Adam Collins. Marks talks about his own test career, the realities of facing fast bowling and his long friendship with Peter Roebuck. Found while searching for something else in the day job. Rob Marchant believes Labour's only hope is that the trade unions will turn on Jeremy Corbyn over the threat that Brexit poses to workers' rights: "Even Corbyn’s great ally on the hard left, Len McCluskey of Unite, is being weakened by the legal challenge to his election as General Secretary, this week announced as being a little more serious than many had expected, now his case will be heard by a former High Court judge." "The British are catching up with an American awareness of the intertwined political influence of the secretive super-rich, social media, and the Kremlin," argues Anthony Barnett. Cicero does not mince his words: "It is a basic contention of this blog that Donald J Trump is not fit for office. A crooked real estate developer with a dubious past and highly questionable finances. he has systematically lied his way into financial or other advantage. His personal qualities include vulgarity, sexual assault allegations and fraudulent statements on almost every subject." Lord Patel says it's now or never for Asian engagement in UK cricket, says Huw Turbervill. Martin Salisbury introduces the work of the artist John Minton. 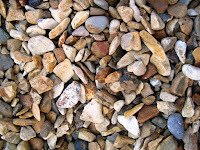 "On the Slaughden peninsula near the Suffolk fishing port of Aldeburgh, there were said to be lights associated with nameless "things" that pelted you with shingle." Matt Salusbury on the mysterious lights of the East Anglian coast. BBC News wins our Headline of the Day Award, but that's not important right now. Johnson and Gove are the worst journalist politicians you can imagine: pundits who have prospered by treating public life as a game. Here is how they play it. They grab media attention by blaring out a big, dramatic thought. An institution is failing? Close it. A public figure blunders? Sack him. They move from journalism to politics, but carry on as before. When presented with a bureaucratic EU that sends us too many immigrants, they say the answer is simple, as media answers must be. Leave. Now. Then all will be well. Another feature of the Johnson and Grove school of journalism is that consistency is not important. All that matters is turning out good copy by your next deadline. So Gove, after presenting himself as the champion of rigour in education, announced that "people in this country have had enough of experts". After presenting himself as Boris Johnson's loyal lieutenant, he stabbed him where it hurts and ran for the leadership himself. The UK would still be able to trade freely within Europe even if it left the EU, Michael Gove has said. The justice secretary said the UK could be part of Europe's free trade area to avoid trade tariffs, even if it was not a member of the EU single market. Michael Gove presents himself as the champion of patriotism in cheese purchasing. Whether he is acting as a journalist or a cabinet minister, all that matters to Gove is tomorrow's headline. She gave it at Pembroke College, Oxford, in April of this year. Susan Cooper's The Dark is Rising is currently being discussed on Twitter - you can find details of how to take part on the blog of Julia Bird. Does anyone else remember watching the first book in that series, Over Sea, Under Stone, as a Jackanory dramatisation in 1969? It is 10 years since Nick Clegg narrowly gained the leadership of the Liberal Democrats. 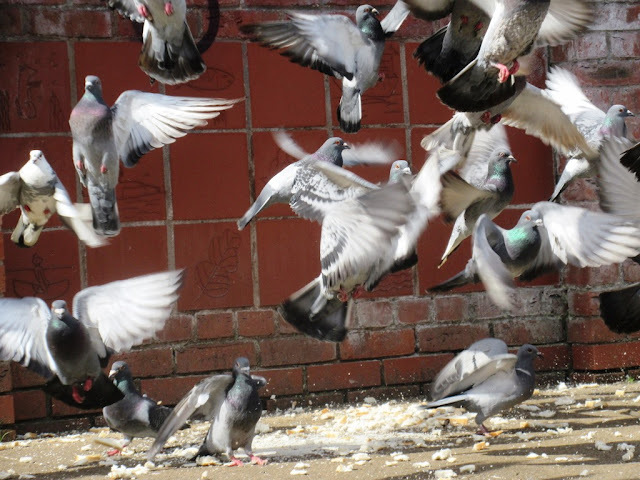 Jen Yockney speculates on what might have happened if Chris Huhne had won instead. Justin Gest asks what lesson can be learnt from the victory of the progressive Democrat Steve Bullock in the Montana gubernatorial race. Nakul Krishna looks at the work of the philosopher Philippa Foot: "Like other philosophers before and since, Foot’s achievement consisted in pointing us in a better direction. Instead of looking to logic or language for answers, she suggested that we look to 'the reality that surrounds man'." The Victorians would prop up their dead and photograph them as part of family groups. Right? Wrong, says Sonya Vatomsky. "For many coming to New York City, the available entry is the Port Authority Bus Terminal ... However, if a traveler seeks the charm of a grand entrance, they will be greatly disappointed ... As one Yelp! reviewer put it: 'If I die and go to hell, I think it might resemble this.'" Margaret McCormick on "a hall of unfathomable nightmares". "Over 50 years ago football had it’s own quiz show. Quiz Ball ran for just six series but is recalled fondly by those who remember it." Vince Cooper will tell you all about it. When I joined the Liberal Party it published a weekly newspaper - Liberal News. This became Liberal Democrat News when we merged with the SDP. I applied unsuccessfully to work for it once and later became an (unpaid) columnist for many years. I even did the desktop publishing on a couple of issues. Liberal Democrat News ceased publication shortly after the party went into coalition with the Conservatives. Its replacement, we were assured, would be a revamped AdLib magazine. This did manage to appear monthly for a while - I wrote for it in those early days, but found this (literally) a thankless task. Then it faded away. Today I received an email from the party's "Director for People" telling me that AdLib is to cease publication. You can find it reproduced without comment on Lib Dem Voice. This tells me, improbably in both cases, that AdLib is "much loved" and costs as much to produce as "the entire staffing budget for the Party's Membership Department!" It's replacement will be an improved AdLib blog. I did not know there was an AdLib blog, but it turns out that there is. Maybe I am just an old fogey and the future for member communications does lie entirely online. But the fact that no one has thought to add the AdLib blog to the LibDemBlogs aggregator does not fill me with confidence. Anyway, if you want to know what is going on in the Liberal Democrats you can always subscribe to Liberator. Taken at Marston Trussell three summers ago. You know the score. Labour and the Liberal Democrats interfere in people's lives. The Conservatives are rugged individualists who have no time for petty regulations or elf 'n safety. Not round here they're not. The Tory-run Harborough District, for instance, can fine you if you feed the ducks on the Welland or fail to produce a bag to pick up mess when walking your dog. Now the Tory-run Leicestershire County Council has joined in by sending the tweet above. If they want to be helpful, the county could tweet some recipes for leftover sprouts. Bubble and squeak for instance. 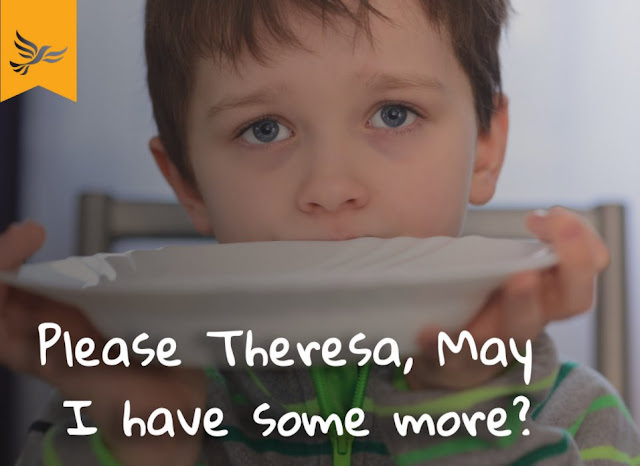 But there are plenty of recipes online so, given the pressures on public services on the county, I think the Tories would do better to redeploy the staff in their Sprout Compliance Unit. They can safely leave the people of Leicestershire to monitor their vegetable intake themselves. Well, he is now, but he never used to be. That is what I have longed believed, and there is evidence to support this view in a page on the Arthuriana site. comes from the mid-fifteenth century, when a Sir Christëmas appears in a carol, although most discussions start with Ben Johnson's early seventeenth-century old or Captaine Christmas. Whilst strenuous efforts were made by the puritans of the seventeenth century to do away with this character, they did not succeed. In the nineteenth century Father Christmas benefited from the general Victorian revival of Christmas and can be found in, for example, Dickens' Christmas Carol. However, from the 1870s onwards Father Christmas became increasingly like the American Santa Claus, both in terms of his actions - he started giving gifts - and his appearance, with the result that two are nowadays virtually inter-changeable. The page also has useful links to more research on this question. Why did white working-class men vote for Brexit? Noam Gidron and Peter A. Hall suggest it is because they have lost social standing over the past three decades. "The UK government can’t leave the Single Market and the Customs Union and, at the same time, avoid a physical border in Ireland," says Flip Chart Rick. If you want to know who matters in Britain, wait until it snows. You will find that the roads are gritted but pedestrians are left to tackle icy pavements unaided. Ludlow's Andy Boddington thinks it is time we did something to help them. Emma Tucker asks if it is time to reassess Britain's postmodern architecture. "Even people who have never seen Michael Curtiz’s romantic wartime allegory can conjure up a few lines about beautiful friendships, gin joints and hills of beans… maybe not today, maybe not tomorrow, but soon." 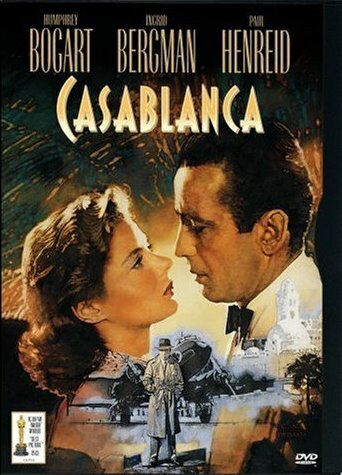 Pamela Hutchinson looks at why we are all still quoting Casablanca. Turning on Radio 4 was dangerous in the 1970s. There was every chance you would encounter Instant Sunshine, the King’s Singers or James bloody Galway. Worse, it could be Cleo Laine. Doo wop, doo be doo, diddly diddly shoo, doo wop, doop doop diddly diddly whop, woop woop shoo wop shoo wop, diddly diddly, bip bop bap, shoobly shoobly woop woo. But my new favourite television station, Talking Pictures TV, has twice shown the 1960 film The Criminal this week. It is a genuine British noir – a crime and prison drama starring Stanley Baker. He was a real tough-guy actor who played hard-bitten cops and hard-biting villains. The song that accompanies the opening credits of The Criminal, sung by Cleo Laine, occupies an interesting space between folk and jazz. It sounds traditional, but was written by Laine’s husband Johnny Dankworth. Best of all, she doesn’t go “shoobly shoobly woop woo” once. Richard Osman is running a World Cup of Christmas Songs on his Twitter account. One of the quarter finals pitted Merry Christmas Everybody by Slade and I Wish It Could Be Christmas Every Day by Wizzard. It was like 1973 all over again, as these were the two songs that competed for the Christmas number one that year. In those days I was a Wizzard fan and very much wanted them to beat Slade. But they didn't and it was Merry Christmas Everybody that topped the chart. I used to feel embarrassed that I had liked Wizzard. But now I realise that they evolved out of The Move and that Roy Wood is a kind of genius. Slade, by contrast, are still embarrassing and I am proud that I never liked them. The good news is that Wizzard won the quarter final, scoring 54 per cent of the vote. I feel history has vindicated me. Otto English is someone I retweet a lot and I was pleased when he started a blog this autumn at Pin Prick. But I have to take issue with his latest post, the wonderfully titled Ladybird Libertarians: Dan Hannan, Paddington and the pernicious impact of 1970s children’s literature on Brexit thinking. 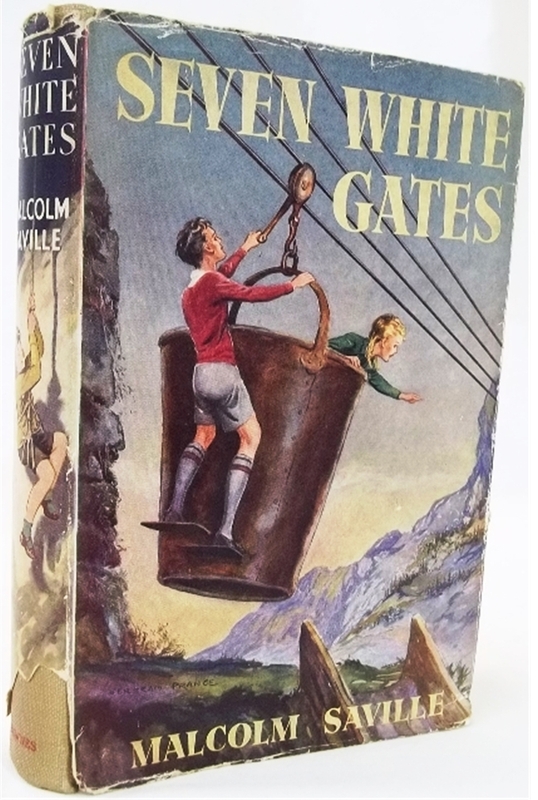 I am the last one to say that the books people read as children have nothing to so with their later political views - after all, I am always banging on about Malcolm Saville here. But the attempt to pin the blame for Daniel Hannan on Ladybird Books seems to be wrong for a number of reasons. This mean he arrived at St Custard's or wherever it was just as Ladybird's heyday coming to an end. 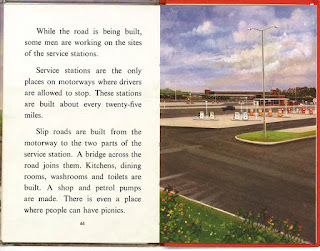 The iconic Ladybird world we remember probably stretched from the 50s through to the 70s. By the 80s, when Britain was changing and Ladybird wasn’t changing at the same pace, there was a feeling that those books were naive and a bit naff. This seems exactly right to me: by the 1980s children's books were expected to be about "issues", not the simple enjoyment of the world around us that Ladybird offered. But would you have found Ladybird books in a prep school in any year? I suspect their market was state primary schools and the children who went to them. The children in the Peter and Jane books from which my mother taught me to read before I went to school (yes, I have reasons to be grateful to Ladybird) may look well scrubbed to modern eyes, but that does not put them into the prep-school-attending classes. There was no real-life Jane. Or Peter, for that matter. Their images were forged from any number of photographs of local children, some taken on the new council estates that were springing up in the late 50s and early 60s. "They were the sons and daughters of respectable workers," he says, "and they were well dressed. You didn't want dustbin kids. But they weren't as middle-class as everyone made out." But the most serious thing the Pin Point gets wrong is the nature of Ladybird Books. I cannot think of a more progressive children's published in their era. Yes, there were the books about the Kings and Queens that Otto objects too, but as he recognises there was also a series called 'People at Work. And it you still think of Ladybird as twee, have a look at this Dirty Modern Scoundrel post on Ladybird Books and Modernism. Even Peter and Jane moved with the times. In the books from which I learnt to read in the early 1960s, Peter resembled the young Prince Charles. By 1970 he had been redrawn with long hair and a cheeky grin and got to wear long trousers. There are other children's books you can blame for the Brexit cast of mind - see my own exposé of Enid Blyton's proto fascism on the Guardian website - but Ladybird Books are innocent (in more than one sense of the word). I saw some discussion of the Wild Hunt on Twitter today and was reminded of Seven White Gates by Malcolm Saville. Then the atmosphere became cold and clammy as the fog swirled round them. suddenly Jenny gave a stifled little scream and pointed up the track which led to the mines. Shadowy in the thickening mist, the two girls seemed to see a figure on horseback waving ghostly arms but no sound of hooves came to their straining ears. Then far away on the hilltop, it seemed to Peter that tiny, gnome-like figures flitted in uncanny procession. Jenny turned and wailed into Peter's shoulder. "Peter. It's true. It's them. They're riding again. What shall we do, Peter? We must hide our eyes. We mustn't even see them. Don't look, Peter." There is more about the Wild Hunt on Wikipedia and more about Malcolm Saville and the legends of the Stiperstones in The Singular Stiperstones by Tom Wall and Peter Francis. Wall and Francis's claim that Saville's discovery of the Stiperstones was, unusually for him, made through other writers' books rather than by visiting the place for himslef is born out by a talk I once heard the late Revd Jeremy Saville (Malcolm's younger son) give. He said he was pretty sure that his father had not visited the Stiperstones when he wrote Seven White Gates. and that the book owed a great deal to the novels of Mary Webb. Seven White Gates, incidentally is a remarkable book. Again unusually for Saville, there are no villains to thwart or buried treasure to find. It is a story about the reconciliation of an estranged father and son. And that reconciliation can be made to stand as a metaphor for the reconciliation of Britain and the USA. Seven White Gates therefore has much in common with films of the period like The Man in Grey of A Matter of Life and Death. In the days when I went on long walking holidays I used to lay out everything I wanted to take and find it was too much for my rucksack. Often my camera was one of the things that was sacrificed. But I did take it with me sometimes. 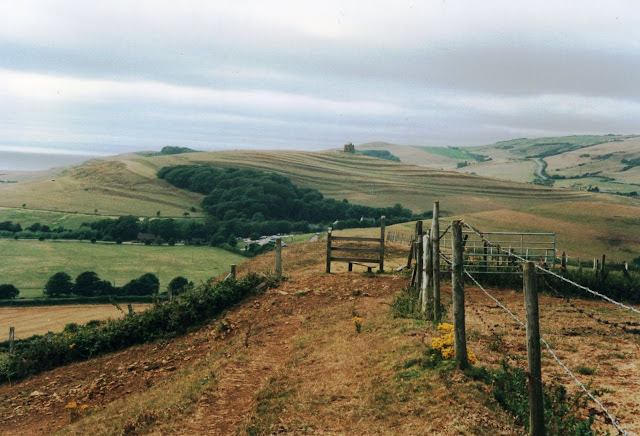 And one of the times I did was 1997, when I walked from Plymouth to Brixham, missed out the area around Torbay on the advice of my guidebook as there was too much road walking, and then continued from Exmouth to Weymouth. This photograph was taken that summer, as Tony Blair enjoyed a political honeymoon that took several years to end. A little research tells me that the building in the distance with the look of a folly is St Catherine's Chapel, Abbotsbury. In those days I tended to photograph landscapes, rather than the buildings I favour today. As I did not have a telephoto lens, the results were not generally satisfactory. But I rather like this shot. Back from the Brink is a conservation project that aims to save 20 species from extinction and benefit over 200 more through 19 projects spread across England. And one of those projects is taking place in Rockingham Forest. Rockingham Forest covers more than 200 square miles, and has long been part of the natural and cultural heritage of Northamptonshire. It was designated a hunting forest by William the Conqueror back in 1086. Much of the once-vast ancient broad-leaved forest remains, but in separate woodland patches, dotted through the arable landscape. These are wonderful places, where nationally rare plants, bats, birds, reptiles and butterflies can still be found. But these fragmented woodlands are under increasing pressure from climate change, nutrient enrichment and a rise in the number of deer. This Back from the Brink project, led by Butterfly Conservation, will restore and manage a network of woodland sites across the Rockingham Forest area, creating more habitat in which vulnerable species can thrive. We will introduce more diversity in the woodlands, increasing the complexity of the forest structure and creating more open space and habitat niches, such as dead wood. We will involve local people, helping them to get closer to the extraordinary wildlife of the forest, and working with volunteers to manage and monitor it. Once enough suitable habitat is available, we will reintroduce the Chequered Skipper Butterfly, extinct in England since 1976. The restoration of direct trains between Oxford and Cambridge moved closer today with the launch of the East West Railway Company. This, says Rail News, will oversee the reconstruction of the link, which exists in some form from Oxford as far as Bedford. When the line opens, it will have interchange stations with four main railway lines radiating out of London, but it will run under or over each, minimising any risk of delay. The aim is to build a route that allows future upgrades to be incorporated with as little disruption as possible. This suggests there will be some major new engineering works at Bedford and Sandy at least. I hope I live to see the day when you can catch a train from Market Harborough to Bedford and change for Oxford or Cambridge. Last time I went to Cambridge I complained about how indirect the rail journey now is from here, and Oxford is no better (change at Leicester, Nuneaton and Coventry). The Pin Prick looks at the influence of Big Sugar on Brexit: "During the 2016 referendum Tate and Lyle Sugars was one of the few big companies to support Leave and this year sponsored the Brexit heavy Conservative Party Conference, a move branded ‘disgraceful’ by British farmers." Policy wonks want to nudge people to do the right thing, but Tim Harford warns that the same techniques can be used to encourage people to do the wrong thing. "What Jim Henson’s fantastic creations capture perfectly is Dickens’s interest in the ludicrous and absurd details of seemingly everyday appearances." Emma Curry argues that The Muppet Christmas Carol is best Dickens adaptation ever. 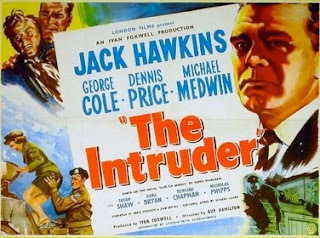 The other day Talking Pictures TV showed The Intruder, a 1953 film that makes an interesting companion piece to another Jack Hawkins film, The League of Gentlemen. dfordoom describes it as "Not quite a crime film, not quite a war film, but an interesting hybrid." Matthew Engel has heard enough from Geoffrey Boycott. Where to begin with British psychogeography cinema? Adam Scovell has some ideas. 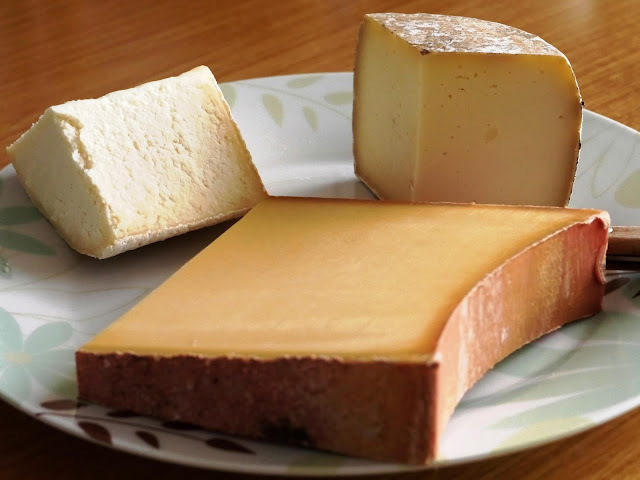 I have been enjoying Alexei Sayle's Imaginary Sandwich Bar on Radio 4. One of the best stories he has told this time is about he and his wife's cat Wilf Mbanga. When it went missing Sayle used his celebrity status to get at article in the local paper. This led to the revelation that the original Wilf Mbanga, a Zimbabwean opposition politician, was living in exile nearby. A tweet by Zorro P Freely led me to a Camden New Journal article that proves the story was true. The real Wilf Mbanga, a journalist critical of the Mugabe regime who lives in London, told the New Journal three weeks ago he was “tickled pink” after hearing Mr Sayle had named his cat after him. But he said he would not join the hunt because he was allergic to cats and suffered from severe hay fever. With world debate focused on the outcome of the Zimbabwean elections and the reinstatement of Robert Mugabe as leader, Mr Mbanga appeared on the BBC World Service on Saturday. But in a surreal few minutes, a newsreader also discussed the missing cat named in his honour. 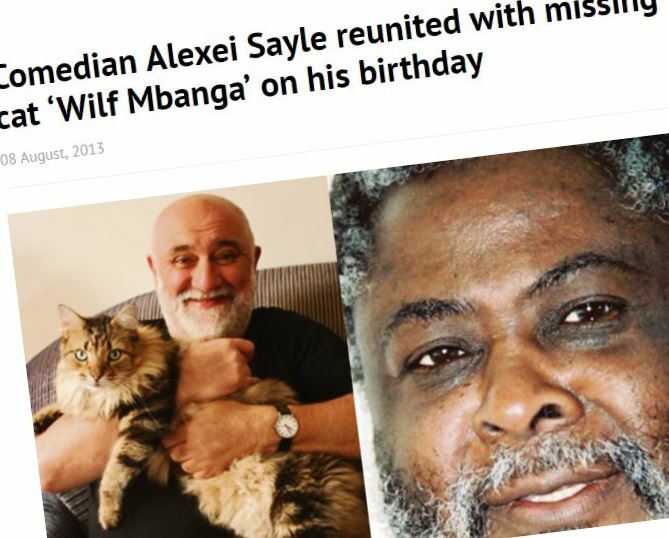 And, in a final touch which I don't think Alexei Sayle mentioned, they first adopted Wilf Mbanga after he had turned up as a stray in John Humphrys's garden. That's the cat, not the exiled Zimbabwean politician.